Chopard "Happy Series" Fun summer dress - Hwatien Enterprise CO.,LTD. This summer, Chopard brought us a series of "Happy"
series: Happy Sport, Happy Diamonds, Happy Dreams and Happy Hearts. Here we enter Chopin world, enjoy the happy summer. Happy Sport is an innovative watch, it is the first time the most precious stones - diamonds, and the most unexpected material - steel, together. Today, it has become a landmark work, and has a large number of different styles. Which watch both cutting-edge technology and fashion interesting, jumping soul with chopard automatic winding movement and rhythm. 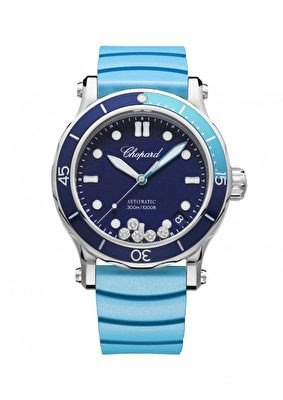 It has a depth of 300 meters of water resistance, and 40 mm stainless steel case connected to the bezel, its one-way rotation and blue-green design from different shades of blue and brightly colored coral; and it highlights the corrugated The design is easy for the wearer to adjust the bezel underwater. This 36 MM automatic winding watch selection of 18K rose gold and steel material, highlighting the extraordinary high-level watchmaking process and unique artistic atmosphere. 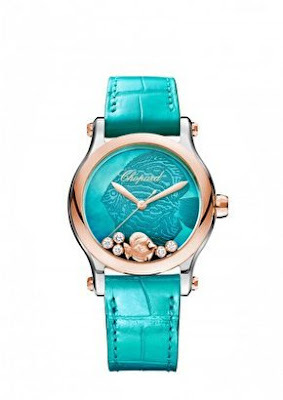 In the polished bezel, a gorgeous 18K rose gold fish elegant cruise, single fish eyes inlaid diamonds, five luminous Smart diamonds in the flashing blue and green shiny mother of pearl dial on the dancing. Dial the central, gorgeous fish contours in the darkness of the faint luminous light. 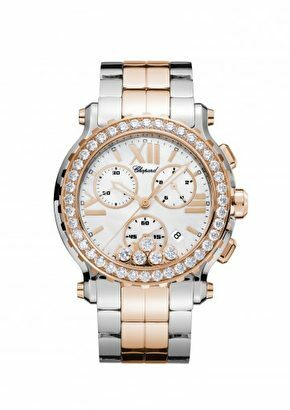 This section of the sports watch both modern style and elegant beauty, while showing the submarine world of fantastic magic, filling the fun of female charm and modern style. 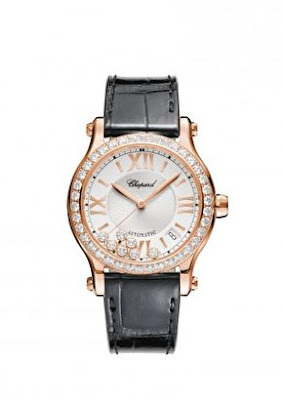 This 36 MM self-winding watch filled with ladies temperament to 18K rose gold case with diamond bezel refined, its beautiful arc and unconventional style reflects the distinctive Chopin personality. Silver dial highlights the Roman numerals and exquisite workmanship details, and Chopard iconic activities of the diamond is cheerful dance, Ambilight. This 42 MM CHRONO chronograph will be sports style and lady style integration, it is a modern fashion leader. 18K rose gold rotating bezel and chronograph function so that this watch filled with full of dynamic, and the activities of the diamond in the proportion of symmetry above the dial completely free to dance. This idea proves that in Chopin, complex watchmaking technology and exquisite jewelry craft complement each other, go hand in hand. 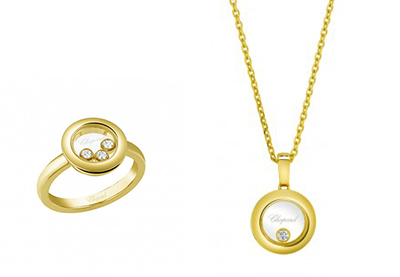 Happy Diamonds Icons series of works is both lively and extraordinary, it is Chopin women's jewelry center series. Its inspiration from the waterfall in the sprinkling, crystal water droplets, in this 18K gold round pendant, the smart diamond in the formation of two pieces of sapphire crystal space free to dance, to create a lively and exquisite exquisite effect. In this Happy Diamonds series of portrait of the new work, Chopard iconic Smart Diamond vivid dance, fl space, take you embarked on a period of Guanghua overflowing, happy endless fantasy trip. 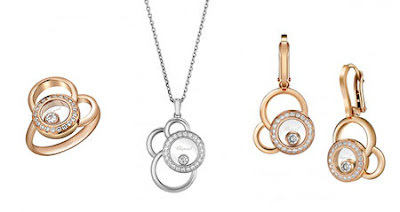 This elegant pendant consists of four different sizes of 18K white gold ring cascade stacked, like an elegant clouds in general, gently volley hanging. Front inlaid diamond ring for three Smart Diamond to create a dazzling edge. In the formation of two pieces of sapphire crystal glass space, diamonds free rotation, reverie wanton flying. 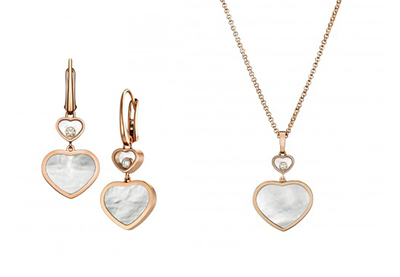 Happy Hearts with heart-shaped iconic design, interpretation of the lively and vibrant creativity. 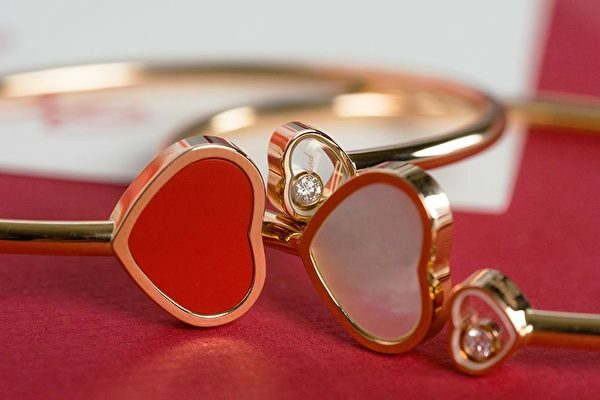 As a classic Chopard jewelry series, Happy Hearts series style meaningful and yet unique personality. This 18K rose gold pendant classic and elegant, heart-shaped pattern to re-decoration of turquoise, hanging in the small heart-shaped decoration, surrounded by a Chopin proud of the Smart Diamond, dazzling pure love.